Only 40 spaces available on each session (apart from the showcase where everyone is invited). Young people, aged 13 - 18 years old, from different backgrounds, are invited to collaborate on a drama piece whilst exploring other forms of creativity, including the use of digital media. We believe that these sessions will benefit all participants in a positive way such as confidence building, self-esteem, team working and networking skills. 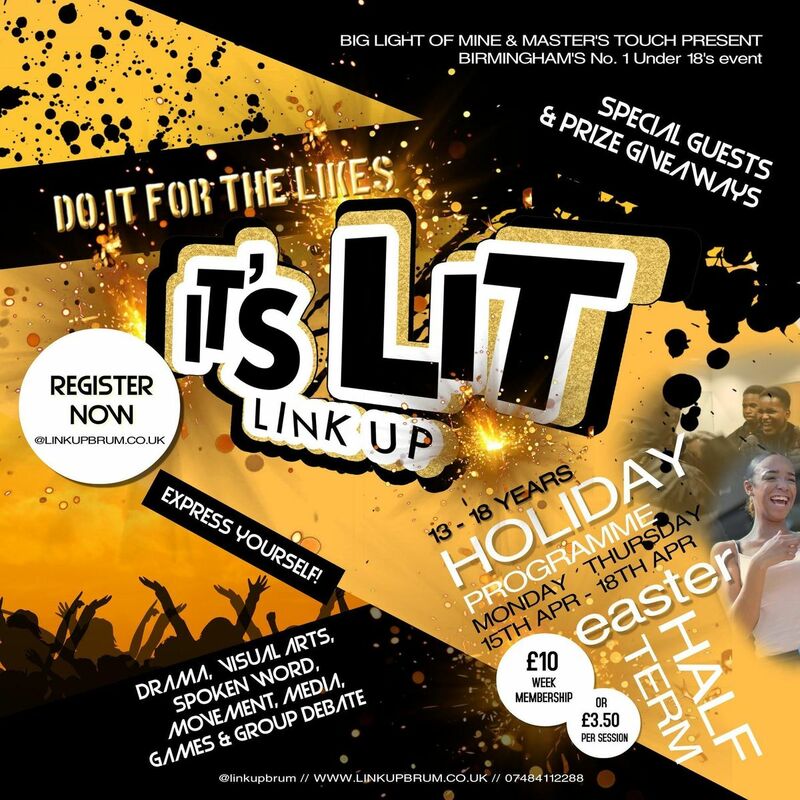 The aim and purpose of It's Lit Link Up is to engage young people in creative arts, music and digital media whilst developing their interpersonal skills, confidence and instigate positive learning and working well with others. There will be various creative practitioners from the music industry, arts and dance community to give advice and support at each session. Special Guest Lauren Alexis social media influencer will make an appearance giving her experience of all things social media... the good, the bad and the ugly! There will also be lots of giveaways from businesses around Birmingham. £10 (+ booking fee) for the whole week which includes lunch. Pay for the whole week in advance to receive a free gift. Or pay £3.50 on each day that you attend. The showcase, which will take place on Thursday 18th April, will be a chance for parents, family and friends to see what the young people have been up to over the week. Performance fee of £3 per person to be paid on the day. It's Lit Link Up, the place to be this Easter!